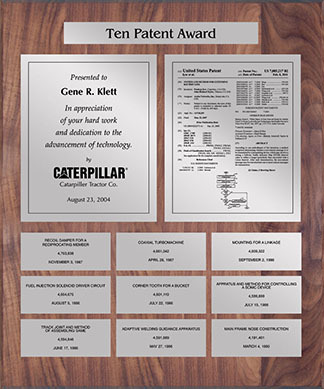 Our multiple-patent plaques are a perfect gift for the inventor with several U.S. patents. The presentation plates come in silver or gold and are mounted on solid Walnut wood recognition plaques which are hand polished to a brilliant shine. The top-right recognition plate is engraved with the first page of the most recent patent, and you can customize the top-left recognition plate with your company information and logo. The bottom recognition plates typically list additional patents issued. All of our multiple-patent plaques are custom designed and engraved in-house, so these multi-patent U.S. patent plaques can be designed to feature any number of patents. Additionally, there is a keyhole on the back of the plaque for easy wall hanging. 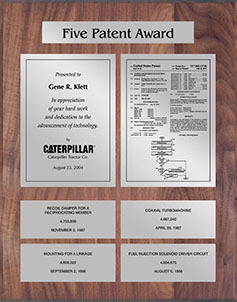 Celebrate the work of your distinguished colleague or employee with a multiple-patent plaque! Please keep in mind that all of our multiple-patent plaques are custom-made, so if you don't see what you are looking for please contact one of our IP Award Specialists and see how we can help you. Check out the variety of 5-series and 10-series multiple patent plaques that we offer below and discover the perfect way to display your impressive awards.